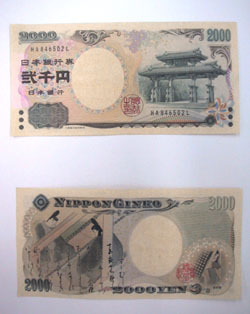 Quite a few people may wonder where the 2,000 yen bank notes have gone since they came out in 2000. “I’ve hardly ever seen a 2,000 yen note over the past six years,” said Kyoko Kanda, 24, an office worker in Tokyo. Kanda’s opinion seems to represent the attitude of many other people who avoid using the so-called millennium bank notes. Economists point out a vicious circle for the bills — the inconvenience makes them unpopular, which in turn results in the Bank of Japan holding back from printing more. Six years ago, the BOJ issued the notes to commemorate the millennium year and the Group of Eight summit in Okinawa Prefecture in July 2000. The central bank has so far printed about 880 million, but the print run declined sharply to 110 million for fiscal 2003 from 770 million for fiscal 2000. The BOJ estimates that 177 million 2,000 yen notes were in circulation as of this July, accounting for 1.6 percent of the circulation of all bank notes, down from a peak of 513 million notes in August 2004, which accounted for 4.7 percent of the whole. 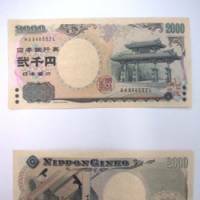 A BOJ spokeswoman attributed the lower demand and circulation to the debut of new 1,000 yen, 5,000 yen, and 10,000 yen notes created in 2004, which lessened the novelty of the 2,000 yen notes. “I think people prefer to hold on to the newer bank notes,” she said, adding that the demand for 2,000 yen notes began to decline steadily from the year the three new notes were launched. But economists say it is the inconvenience that causes the 2,000 yen notes to be unwanted. “The emergence of the new paper money may be one cause, but the overall ineptness of the bills is the main cause,” said Toshihiro Nagahama, senior economist at Dai-ichi Life Research Institute Inc. 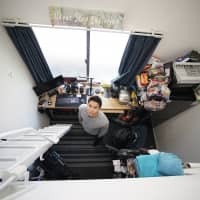 He said that not only are there a limited number of ATMs and vending machines that accept them, their color and design resemble that of 5,000 yen bills, which often confuses users. He also said customers are often displeased to receive the bills. A spokesman for supermarket operator Daimaru Peacock said people aren’t yet used to the bills even after six years. And this unfamiliarity keeps its supermarkets away from using the 2,000 yen bills proactively. 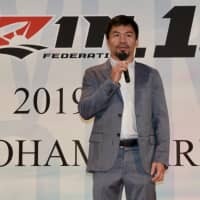 Nagahama doubts the bills can survive. “I think the 2,000 yen notes will eventually disappear. By the time the BOJ renews the bills, say maybe within 15 to 20 years, the bank may stop making them, given the current stagnant situation of the notes,” he said. But a Finance Ministry official said the ministry believes that almost all ATMs throughout the nation are now capable of accepting 2,000 yen notes. 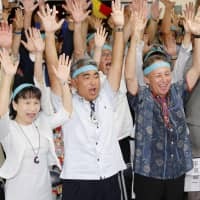 Furthermore, the ministry has been discussing with the BOJ to further improve their usability, while the BOJ’s Okinawa branch has been making progress there. Unlike the rest of Japan, circulation has been increasing in Okinawa thanks to efforts by both the public and private sectors. Noting that Okinawa’s landmark Shureimon Gate is depicted on the bills, the Okinawa branch has set up a task force to promote their use. 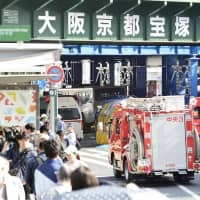 The unit, whose members include the prefectural governor, the heads of banks and business leaders, has been asking local hotels, supermarkets and companies to use the millennium bills for change and salary payments. “I don’t think the bills will become extinct as there seems to be a certain amount of demand,” said the Finance Ministry official. But he also said that as a public organization, it can’t pressure private firms to use the bills.